When Nikki Janicek sprints from the 200-degree sauna out into the 100-below darkness wearing nothing but bunny boots, at least she’s not alone. She already has survived months of solitary confinement, a forced swim with sharks and a scary journey to the South Pole. Now she’s a member of The 300 Club, an exclusive group of people on the planet who have endured a 300-degree temperature swing in a matter of seconds. It’s all part of her training for a six-person, one-way mission to Mars. Nikki wants to go, but not with The Bridge — a space-obsessed company that abducts, controls and violates people. She wants to take a stand. She wants to free her father, her former lover and herself. And she’ll attempt it with the help of the young man who shot her seven years ago. It’s a previously inconceivable alliance, bonded by polar extremes. 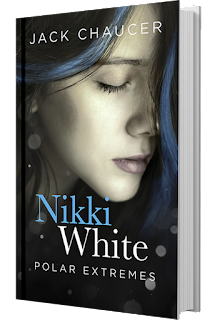 Nikki White Polar Extremes is the third book from the Nikki Series. I feel honored to review the entire series and now I can say this one is my favorite. The book was full of twists and turns, which makes it more exciting to read. There were also heart stopping events on the first and last part of this book, it literally made me curse (i don't curse). LOL. Anyway, back to my review, Nikki stayed in South Pole for her Mars expedition training, I could say it wasn't easy -- I think I will die there though -- and the appalling part? her companion, I think that was the challenging part, Nikki was forced to be with him. They're the "chosen one" for this expedition but despite these tricky incidents, I ship them both! *fangirling*. Nikki here is more of a fighter, she changed a lot from book one. I would love to reveal who I'm talking to so bad but I think it's better for you guys to find out. I'm still swooning between Nikki and that guy. This book left an open ending though it was a happy one. PS. it's hard not to spoil the readers! "Every relationship has boundaries that should never be crossed." Jack is the author of the YA novel "Streaks of Blue" (2013) and its NA sequel, "Nikki Blue: Source of Trouble" (2015), as well as the political sci-fi thriller "Queens are Wild" (2012) and YA rock 'n' roll novella "Freeway and the Vin Numbers" (2010). The third book in the Nikki series, "Nikki White: Polar Extremes," was published on March 24, 2017. He's also working on an easy reader children's book titled "The Password is Whishpers." Jack lives in Connecticut, U.S.A., with his wife and twin 5-year-olds. He also enjoys reading and reviewing a variety of genres, watching "Game of Thrones" and "Halt and Catch Fire," and drinking pints of mead.